Leadership—and how it relates to ministry—is a subject I address before audiences across America. I get to help all kinds of people in all kinds of situations at live events and through “The Leadership Momentum” podcast. It’s amazing to see how many ideas are floating around about leadership. In every organization, it seems to mean something different. But should it? Yes and no. Leadership will look different in a nonprofit organization than it does in a for-profit company. Leadership can look different in different settings—but the core should never change. Hebrews 13:7, my favorite leadership verse, identifies some of the essential elements of leadership: “Remember those who rule over you ... . Follow their faith, considering the results it has produced in their lives.” This verse eloquently highlights the importance of modeling servant leadership for others, inspiring teams to work together and passing on a belief system that builds an incredible culture. In your business, leadership starts with you. Measure yourself against the principles in Hebrews 13:7 by answering these questions: How are you modeling leadership? How are you communicating your belief system? How are you inspiring people to change? Think about whether your team is imitating your core values—even when you aren’t around. Your ability to inspire others as a leader doesn’t just affect your team’s morale. It impacts your bottom line. Team members will not believe in the vision of your store or business until they believe in you as a leader. And if they don’t believe, they don’t have any incentive to see what they do as more than a J-O-B. Team members who are inspired are more effective, creative and productive. When your team invests passion and energy in their responsibilities, it trickles down to your customer base—which, in turn, leads to financial profit. It all begins with you. One of John C. Maxwell’s leadership principles is called “The Leadership Lid,” which says that leaders are never limited by their opportunities or their team’s performance. Rather, they are limited only by their own level of leadership. Your team will never grow beyond our lid. That means you must do two things. First, identify your weaknesses as a leader and determine how much you can improve in those areas—then do it. Second, encourage your team members to challenge themselves. You may find that someone on your team fills a gap that you can’t fill. Give that person a chance to shine. Delegation and mentoring can give you a bigger lid, which increases the potential of the entire team. Again, not only does this affect morale, but it can also impact your bottom line. Putting the right people in the right spots improves the products or services you provide. Customers will respond by giving you their trust. You have the power of inspiration. Leadership is “the art of inspiring others toward a common goal.” But how do you know you are truly inspiring others? You practice leadership based on persuasion rather than on position. Imagine you have a new process you think will give your business a leg up on the competition. You can exert the authority of your position with your staff or you can encourage their buy-in of the new process through persuasion. Which of these approaches do you expect will give you the most effective outcome? Which will create the strongest momentum for your business? When you lead by persuasion, you and your team members are pulling on a rope—working together like one side of a tug-of-war competition. But leading by position is more like pushing a rope—and pushing a rope accomplishes nothing! If you want to model servant leadership, the first principle of Hebrews 13:7, find ways to bring your team together. Inspire through persuasion, not your position. You’re probably starting to see that leadership is more than managing people. It’s connecting with people! As a leader, everything you say, do and are should unite people and point them toward that common goal. Leaders work toward team unity through core values, reflecting another principle from Hebrews 13:7: Pass on an example worth imitating. You set the tone. When you live out your core values—personally and professionally—in front of your team members, the results spread like wildfire. That creates a culture any organization would envy. It’s a great way to share life—and leadership—with others. Have we mentioned that genuine leadership starts with you? I thought so. But that’s good news! It’s empowering to know that you really do have more influence than you probably thought! You just have to use it effectively. As a leader, you can inspire others. You can transform your business, encourage your team and improve your customer relationships. Create a new culture and you will also enhance your bottom line. Chris Brown is a nationally syndicated radio talk show host, pastor and speaker, carrying the message of stewardship and intentional living nationwide. “Chris Brown’s True Stewardship,” available on radio stations across the country, provides biblical solutions and sound advice for questions on life and money. 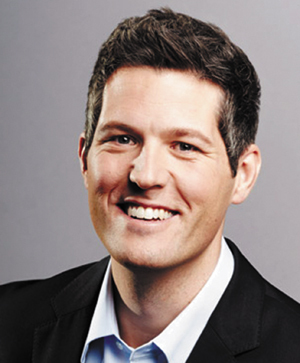 Follow him on Twitter @chrisbrownonair, on Facebook at facebook.com/chrisbrownonair or online at stewardship.com .